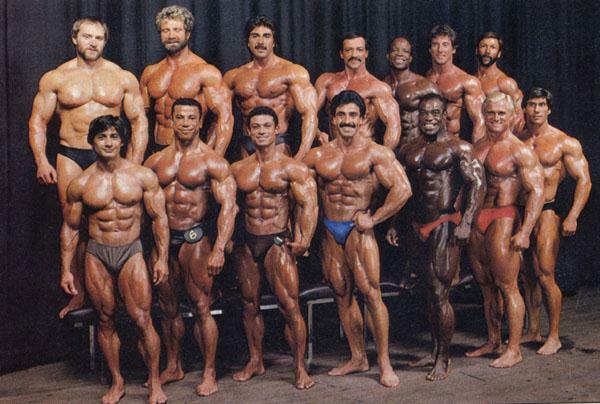 The 1980's was a transition period where many of the old school bodybuilders (Arnold, Franco, Lou Ferrigno) had largely dropped out of the scence and were being replaced by new faces. But Arnold had to have one more shot at it, and in the most controversial Mr. Olympia events of all time, won a contest he probably should have come in 5th or 6th. Chris Dickerson, a journeyman bodybuilder, put together his ideal physique and finally won the Mr. Olympia title – once. He was notable for being the first person so old to win (he was 43). It appeared that the 80's would be an era of several new players and indeed it was at the mid-level of the sport but not at the top. Lee Haney grabbed the Olympia title and didn't let go until he had actually surpassed Arnold for repeatedly winning the top slot. It had seemed that no one would ever be able to top Arnold’s consistent winning feats but within one bodybuilding generation Haney had topped Arnold. Haney was big (close to 250 in contest shape) and ripped and trained very hard, with a good deal of volume. Haney was so well developed that no one could come close when he was in top condition. Again, this era had its aesthetic stars, including Samir Bannout and Lee Labrada. And the movie career of Arnold really took off in the 1980's, shining a brighter spotlight on bodybuilding.